Home cooks head to The First Mess blog for Laura Wright's simple-to-prepare, seasonal vegan recipes, but stay for her beautiful photographs and enchanting storytelling. In her debut cookbook, Laura presents a visually stunning collection of heirloom-quality recipes highlighting the beauty of the seasons. Her 125-plus produce-forward recipes showcase the best each season has to offer, and as a whole, demonstrate that plant-based wellness is both accessible and delicious. Wright grew up working at her family's local food market and vegetable patch in the Niagara region of southern Ontario, where fully stocked root cellars in the winter and armfuls of fresh produce in the spring and summer were the norm. After attending culinary school and working in one of Canada's original farm-to-table restaurants, she launched The First Mess blog at the urging of her friends in order to share the delicious, no-fuss, healthy, seasonal meals she grew up eating, and quickly attracted a large international following. The First Mess Cookbook is filled with more of the exquisitely prepared plant-based recipes and lush photography that fans of the blog have come to expect. 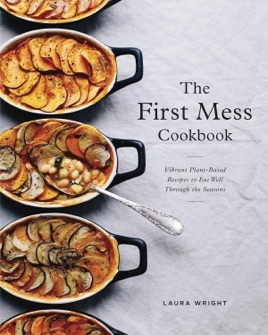 With recipes for every meal of the day, like Fluffiest Multigrain Pancakes, Meyer Lemon Romanesco Glow Salad, and Eggplant "Bolognese" Pasta, and desserts like Earl Grey Tiramisu, The First Mess Cookbook is a must-have for any home cook looking to prepare nourishing plant-based meals with the best the seasons have to offer. Canada-based blogger Wright (the title of both book and blog derives from an M.F.K. Fisher quote) captures the spontaneity of online writing in this vegan cookbook. Her encouraging tone pervades recipes such as broccoli Caesar with smoky tempeh bits. Eschewing vegan pastry and topping individual vegetable and bean pot pies with potato crusts is quick thinking. But, as on the Internet, the downside to spontaneity is an occasional lack of factual foundation. The fall/winter stalwarts featured in Wright's root vegetable dal are seasonally mismatched with cherry tomatoes. If quinoa needs bean puree to impersonate risotto, why not just make risotto? Health claims are hinted at in recipes such as a kale salad with "Master Cleanse" dressing, and Wright dabbles in raw foods, including an unbaked beet velvet slice with a citrus frosting for dessert. A range of dietary concerns (cane-sugar-free, oil-free, etc.) are indicated with symbols, and more time-consuming projects are marked as well. Some recipes would be better off as quick sidebars: Wright provides not one, but two recipes for tea.